Walker Lake is a 239-acre impoundment used for flood control and recreation and is located in Snyder County near the town of Troxelville. The lake and shoreline are owned and managed by the Pennsylvania Fish and Boat Commission (PFBC) for recreational fishing and boating. Fish species present include northern pike, largemouth bass, walleye, black crappie and bluegill. Commonwealth Inland Waters regulations are currently in effect. The only species currently stocked by the PFBC is northern pike. 50 yellow perch from 5 to 9 inches. Biologists also caught 2,572 black crappies, 414 bullheads, 297 bluegills, 190 golden shiners, 38 carp, and 38 white suckers. 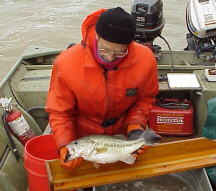 The Commission plans to sample the lake again in June to evaluate largemouth bass and panfish populations.